Christmas, 1958: Elvis is on the radio, Ike is in the White House, the Lord is in his holy temple ??? but there is no peace in Mt. Jefferson. In a small town where everybody seems to know everybody, there are still a few secrets. Three families find they are connected in ways they never suspected: an angry teen, a dying man, a lonely wife, a daughter in trouble ??? just ordinary people, muddling their way through ordinary challenges. Marriage. Illness. Bad decisions. Friendship. Faith. Forgiveness. Spanning three generations, O Little Town is a reminder that people still make mistakes, that forgiveness can still be granted, and that people still rise to the occasion and do the right thing. This tender tale of love and redemption?? ?and a lonely gravesite where roses mysteriously appear every Christmas?? ?will touch readers' hearts. Don Reid, a member of the Statler Brothers, country music's premier singing group for nearly forty years, has established himself as a singer and professional writer in multiple fields.As a songwriter of 240 published and recorded songs, many of them number one and top ten hits, Reid is the recipient of 18 BMI (Broadcast Music Incorporated) awards, 3 Grammy awards, 9 Country Music Association awards, 48 Music City News/TNN awards, 13 gold albums, and 8 platinum albums.Reid also cowrote (with his brother Harold) the television seriesThe Statler Brothers Showand numerous TV specials. He has published three nonfiction books (Heroes and Outlaws of the Bible,Sunday Morning Memories, andYou Know It's Christmas When. 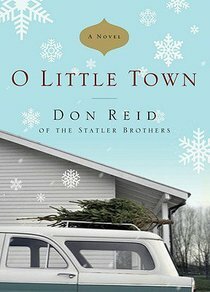 ).O Little Townis his first novel.Don lives with his wife, Deborah, in Staunton, Virginia.